To Cite: Sami S H, Jamshidi K, Shoushtarizadeh T. Intraarticular Synovial Cavernous Hemangioma: a Case Report and Review of the Literature, Shafa Ortho J. 2014 ; 1(2):e69. Abstract: Hemangiomas are benign vascular malformations that closely resemble normal blood vessels. Synovial hemangioma is a well-recognized but rare entity. 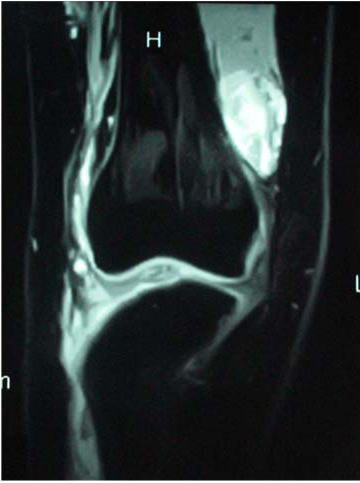 It originates from synovial lining, with typical intraarticular variety that almost invariably occurs in knee joint. We report an intraarticular synovial cavernous hemangioma, along with its clinical course and management. Hemangiomas are benign lesions that closely resemble normal blood vessels. Those present at birth are vascular malformations, whereas actively growing lesions presenting shortly after birth are neoplastic (1-3). Although the etiology remains unknown, some vascular lesions have been linked to specific genetic defects (4, 5). Hemangiomas may be of two general types: those that are more or less localized to one area and those that involve large segments of the body. The latter type, known as angiomatosis deserves specific attention because of the inherent problems it poses in diagnosis and treatment (2, 4). Cavernous hemangiomas are less common than capillary ones but share common age and anatomic distributions. They show no tendency for spontaneous regression and in contrast to capillary ones need surgical resection for treatment (4). Synovial hemangiomas are a well-recognized but rare entity. It can arise from synovial lining, and its most characteristic form is the intraarticular variety that almost invariably occurs in knee joint. Treatment of local or pedunculated tumors is by simple surgical removal. Diffuse lesions are more difficult to eradicate surgically and small doses of radiation have sometimes been advised (6-8). Here we are presenting a young patient who had both intraarticular forms of cavernous hemangioma of knee as well as concomitant intramuscular hemangiomatosis of vastus medialis muscle that was treated simultaneously by surgical resection. A 14 years old girl was referred to our clinic with chief complain of right knee pain and swelling. Thepain started 8 months ago and she remembered no trauma to her right knee region or any febrile episode meanwhile. The pain grows gradually by time and for the past couple of months she noticed right knee swelling. She was visited by her general practitioner who prescribed her some non-steroidal anti-inflammatory medicine and restricted her from physical exercises. Plain x-ray showed no abnormal finding in that time. When clinical improvement fails to occur, she was referred to a rheumatologist who ordered some lab tests and performed aspirate right knee. All laboratory data were within normal limits including the ESR that was 8 mm per hour. 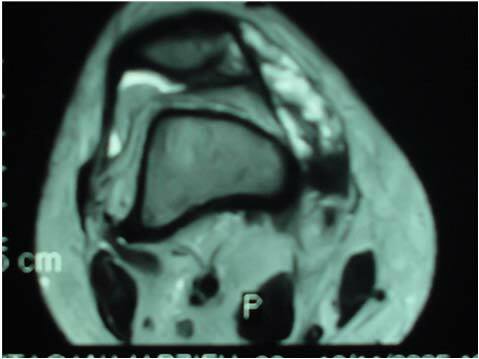 The knee aspirate was serosanguinous, thus, a knee MRI was ordered that showed signal abnormalities in vastus medialis muscle as well as a heterogeneous signal abnormality in the knee joint. The differential diagnosis radiologically was between an intramuscular and intraarticular hemangioma and pigmented villonodular synovitis. The patient was referred to our clinic and underwent an open right knee arthrotomy. 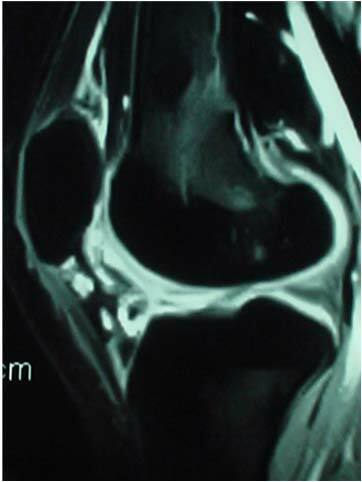 During surgery a discrete pedunculated intraarticular soft tissue mass was observed in her right knee. The vastus medialis muscle next to the knee was abnormally invaded by engorged dilated blood vessels. The intraarticular mass was excised totally as well as the abnormal areas in her muscles and sent to pathology laboratory. Post operatively she was well, and the pain was subsided significantly after a period of physical therapy. The pathology of intraarticular lesion was compatible with intraarticular synovial cavernous hemangioma. The intramuscular lesion was identified to be a hemangioma. Hemangiomas are benign, nonreactive process in which there is an increase in the number of normal or abnormal-appearing vessels, recognizing that many of these lesions represent tissue malformations rather than true tumors. Hemangiomas are one of the most common soft tissue tumors and account 7% of all benign tumors. It is the most common soft tissue tumor during infancy and childhood (1-4). Most hemangiomas are superficial lesions that have a predilection for the head and neck area but may also occur in organs such as liver. 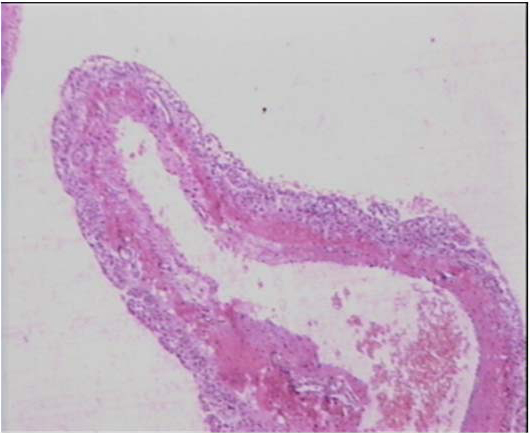 Capillary and cavernous hemangiomas of adults mostly observed in females might be hormone dependent, although never undergo malignant transformation. Synovial cavernous hemangioma is a rare entity that can arise from any synovium lined surface and therefore may be found along the course of tendons or in joint space (6-8). It often presents as a painless soft tissue swelling. Intraarticular cavernous hemangiomas are rare and almost always involve knee joint. It causes recurrent episodes of pain, swelling and joint effusion. Symptoms usually begin in childhood and persist several years before the time of diagnosis. In most cases a spongy compressible mass that decrease in size by elevation over the joint (7-9). Plain films are non-specific to some soft tissue density and capsular thickening in some cases. Arteriography is more diagnostic in showing blood pool over the mass but it is a painful and invasive procedure. Recently MRI has been a great help in diagnosing these lesions. The lesion can be either pedunculated or as a diffuse process. Histologically, the tumors are cavernous hemangiomas in which the vessels are separated by an edematous, myxoid or focally hyalinized matrix occasionally containing inflammatory cells and siderophages (6, 7). There is no general agreement concerning the pathogenesis of these lesions. It has been suggested that those lesions are not neoplasms but represent a reaction to trauma although such a history is given in only a small number of cases. On the other hand, the young age of onset raises the question as whether these lesions are congenital malformations or tumors, especially because occasional patients have been noted to have hemangiomas elsewhere as is in our patient who also had hemangiomatosis of thigh muscles. Treatment of local or pedunculated lesions is a simple surgical resection. This can be performed either by open arthrotomy or arthroscopic methods. The treatment of more diffuse lesions is much more difficult and might need some adjuvant radiation therapy to prevent recurrences (8, 9).